In 2012, it’s no secret that anime from Japan is that nation’s most popular and influential cultural export. That may appear overblown to some, but I’m hard-pressed to think of something that beats it — and that’s saying a lot, because we’re in an era where Japanese stuff is so pervasive now. That’s also saying a lot because I’m old enough to remember when admitting something was from Japan was an invitation to get guffaws, the punch line to a setup in a joke about something cheap, junky or inferior. Even if the intent was benign curiosity, something that was Japanese could invite unwelcome scrutiny. Back when I was a seventh-grader, my mother packed a school lunch one day that included a nori-wrapped onigiri that prompted a teacher who was monitoring the lunchroom to come over and say, “Eew, what’s that? !” Just what you don’t need when you’re in middle school! Now, though, Japanese food gets high marks from foodies for taste, presentation and healthfulness. Not only that, practicing judo or karate is common. Studying ikebana, cultivating bonsai or practicing Buddhism won’t cause anyone to bat an eye. It’s as though the rest of the world caught up to what anyone of Japanese heritage already knew: Japanese culture and all its appendages ranks up there with the best of anything that any other nation or culture has to offer. Anime, however, doesn’t have the centuries-old lineage of, say, Japanese calligraphy or brush painting. So while it might be considered by high-minded types to be “low” culture for the masses, it is now super-influential across Asia, North and South America and Europe, a real-world measure of Japan’s “soft power” in terms of affecting the world beyond its borders. Anime style (and that of its comic book cousin, manga) has even exerted its influence on American animation. I recently checked out from the library the recent Japanese “Ironman Anime” that featured “shellhead” and his alter ego Tony Stark, but rendered in the distinctive style of anime. In the mid-1990s, there was the “Teen Titans” cartoon that was also given the animé treatment, complete with a theme song by J-pop duo Puffy AmiYumi. The American fanbase of anime, meantime, is huge and fervent. I hesitate to call it a subculture anymore because it’s so prevalent. The are anime conventions, with fans of “cosplay” (costume play) dressing up as their favorites characters, too. As I understand it, some fans (and I’m not talking Japanese Americans here) have gone so far as to learn Japanese as best they can to understand the dialogue. The appetite for new material no doubt translates to millions of dollars in worldwide revenue annually. So, it was probably inevitable that Crunchyroll would be born in the meeting between Japanese creativity and American entrepreneurship. Crunchyroll (or Crunchyroll.com) is a relatively new company that has licensing deals with Japan’s top anime content creators and makes the shows available via its website almost immediately after being originally broadcast in Japan. 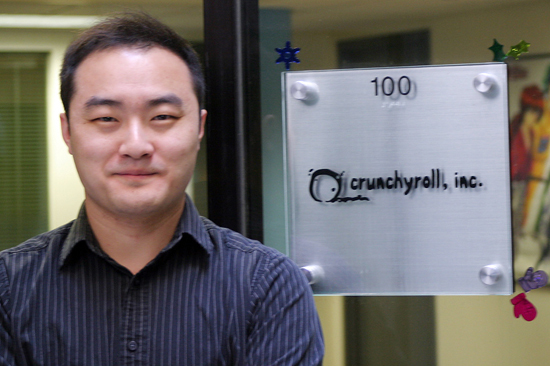 Its co-founder, Kun Gao, likens it to a Hulu for Asian content; even though anime is the mainstay, Crunchyroll also delivers Korean dramas. Gao, to whom I was introduced by V3 co-organizer Gil Asakawa, was at the confab as a member of a panel discussion on anime and manga in the digital age. After meeting Gao, also Crunchyroll’s CEO, at the Aug. 24-25 V3 conference, I followed up with a telephone interview with the 30-year-old after learning the company he co-founded has 100,000 paid subscribers and more than 8 million free viewers. Pretty good for a company “officially” founded in 2009. In his pre-college days, Gao was a fan of anime, which came in handy when Crunchyroll was in its original incarnation as a site where fellow anime fans could post clips from their favorite shows, a ala YouTube in it early days. That attraction he had for animé would, however, later prove to be the basis for a business. 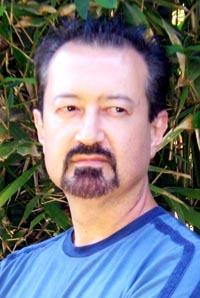 After graduating from UC Berkeley with a degree in electrical engineering, the Beijing-born, California- and Texas-raised Gao says his life changed after working for the website HotOrNot.com, where he got a first-hand, behind-the-scenes look at how a website drew traffic. The plans to pursue a Ph.D. would, to his parents’ chagrin, have to wait. After Crunchyroll got going, Gao and his partners decided to go legit. They got rid of all the copyrighted anime material posted by fans and made deals with Japanese license holders to legally have access to the shows in North America. Now, once a show they have a deal with has aired in Japan, Crunchyroll is free to repost the shows on the site and share subscription revenue with the rights holders. One thing Gao’s company also does is get its staffers to immediately translate the shows from Japanese and provide subtitles in English and Spanish. Noting that most of the site’s fans are not fluent in Japanese, Gao says that Crunchyroll has hired language experts to translate the dialogue for subtitles. All this, incidentally, is done immediately. “Our fans, from what we’ve seen, they prefer the show with subtitles rather that dubbed because they want to experience the original audio language,” said Gao. He also noted that dubbing is very expensive in comparison. None of this could be done without backers and Gao said via email that Crunchyroll is backed institutionally by Venrock, with strategic investors including TV Tokyo and Bitway; angel investors include Max Levchin (founder and CTO of PayPal), James Hong (founder and CEO of HotOrNot.com) and Naval Ravikant (founder and CEO of AngelList). Crunchyroll, if you haven’t gathered by now, is not a site where you can just view or download whatever you want to see for free. You have to subscribe, although a free trial is available and the prices, once your hooked, are reasonable. From what I can tell, this development is a boon for anime fans and the content creators. While it’s still a niche, it’s a good niche and one can make a nice living serving a good niche. The business model does, however, have implications it would seem to me for traditional broadcasters like the local Channel 18.2, which provides Japanese language programming via digital TV. It’s possible that the Crunchyroll model could upend outlets like that; only time will tell if someone comes along and tries that or if the Channel 18.2s of the world go that route themselves. Bottom line: If you’re an anime fan, give Crunchyroll a try. You will, however, have to provide your own shoyu and wasabi.